Welcome to YogaFit Ibiza! 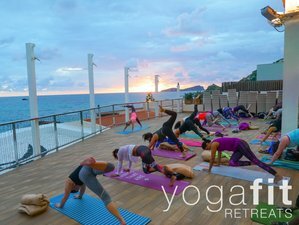 YogaFit Ibiza provides the only all-inclusive, resort based yoga and fitness retreats on the beautiful, healing island of Ibiza and are based at the Invisa Beach Resort, on the North East of the island. YogaFit Ibiza's retreats are designed to give you the benefits of yoga and fitness together, combining the two for a restorative and balanced break. Whether you are a beginner or fitness professional, YogaFit Ibiza is designed for you. To help make things a little easier, all training, classes, food, accommodation and even childcare are included. You will be greeted by a professional and friendly team, keen to give you the very best experience possible. If you would like to join but cannot commit to the whole retreat, YogaFit Ibiza provides 3 to 7-night retreat packages. Enquire for more details and price for your ideal length break. The stunning venue for this retreat is the Invisa Hotel Club Cala Blanca in Es Figueral which is located in the eastern side or sunrise coast of Ibiza. Located on a beautiful sandy beach and surrounded by stunning woodland, this resort consists of 465 rooms, with different accommodation options: single, twin, family, or suite. All rooms are en-suite and have terraces. The resort also features Invilandia, a space of 5,000 square meters which is especially devised for children. It has mini club games and activities with a swimming pool as well as aquatic area with slides and themed pirate motif. While children play and have fun in the designated spaces, adults can relax in the Buddha chill out space with a cocktail, hear the sound of the Jacuzzi bubbles, or enjoy tanning on the Balinese sun beds. Sports are also very important at Invisa Hotel Club Cala Blanca because it has a gym with fitness machines, as well as installations prepared to practice outdoor sports, such as badminton, beach volley ball, archery, tennis, etc. The schedule above is subject to small changes, depending on availability and time of year. You may spend fewer nights at the retreat: 3 nights for 365 GBP (shared room), 4 nights for 480 GBP (shared room), 5 nights for 590 GBP (shared room), 6 nights for 690 GBP (shared room), 7 nights for 775 GBP (shared room). Platja es Figueral is the ideal destination for a vacation in Ibiza. Es Figueral Beach is located in the town of San Carlos. The beach is at the height of the island of Ibiza, a great island for an unforgettable vacation. Figueral has fine sand, crystal clear and deep water, and is surrounded by steep rocks. Many photographers fall in love with the beauty of this beach. The beach is accessible by all types of transportation and ideal for those who are traveling with children. Ibiza is one of the Spanish vacation destinations with the greatest influx of tourists from all over the world. Nobody wants to lose the charm of one of the most beautiful islands of this country or its leisure possibilities. All-Inclusive buffet style restaurant, with a healthy eating plan provided by the on-site nutritionist. Please arrive at Ibiza Airport (IBZ). Flights are currently available from 55 GBP on skyscanner.net. For transfers, YogaFit Ibiza will be providing some minibuses (numbers dependent) and taxis are 45 GBP approximately each way. Car hire is currently around 17 GBP per day from YogaFit Ibiza's partner who drops the car to the airport. Closer to the event YogaFit Ibiza will be setting up a taxi and car sharing group to be a little more economical and green! YogaFit Retreats runs friendly, inclusive retreats that offer a variety of holistic and fitness classes as well as workshops in nutrition and life-coaching.